Only having nine plays to choose from? Only six bowl practices? Playing the 11th ranked defense? Heisman Candidate? Seven Point Underdogs? Doesn’t matter. Our undersized line and bowling ball fullbacks will continue to march down the field like an Abrams Tank. The Sons of Slum and Gravy did exactly what I prescribed in in my game preview (win the turnover battle, keep their defense off the field, finish drives, and catch one big break). The Aztecs had two turnovers including a 29-yard fumble recovery touchdown on the last play of the game by Elijah Riley. The Black Knights Offense played their part by possessing the ball for 46:00 minutes or 76% of the game, which kept Penny of the field. They also finished five of their eight drives with touchdowns. We caught a couple big breaks during the game. The two biggest were Jaylon McClinton’s tipped pass and the 2-point conversion where San Diego State blitzed up the middle, creating a walk-in touchdown for Kell Walker. I am not a fan of Army trick plays. They hardly ever work, with the exception of Buffalo fake punt this season and the 2013 Flea Flicker Pass to Xavier Moss against Boston College. When they do work it’s great, but I’d rather keep chugging out 4 yards a play. Well, this trick play didn’t work as San Deigo State intercepted Kjetil Cline’s pass. It looked like we were going to go down 14 points with only one quarter left, which would assure an all but certain defeat. Enter the Army Defense. The rest of the game details will be covered in the superlatives below. So I’ve literally watched most of every bowl game so far this year (check my predictions here, there are still 28 games left) and no game has had as many fans in attendance as the Armed Forces Bowl did. I think the annual Goat vs. Engineer game brought out more fans than the Bad Boy Mowers Gasparilla Bowl did. It really doesn’t matter what the Offical Attendance stats say, because this game is the only one that I’ve seen where the stadium was almost completely full. I know for a fact that most of the fans were Army ones since I could hear “Let’s Go Army” being chanted at various points throughout the broadcast. 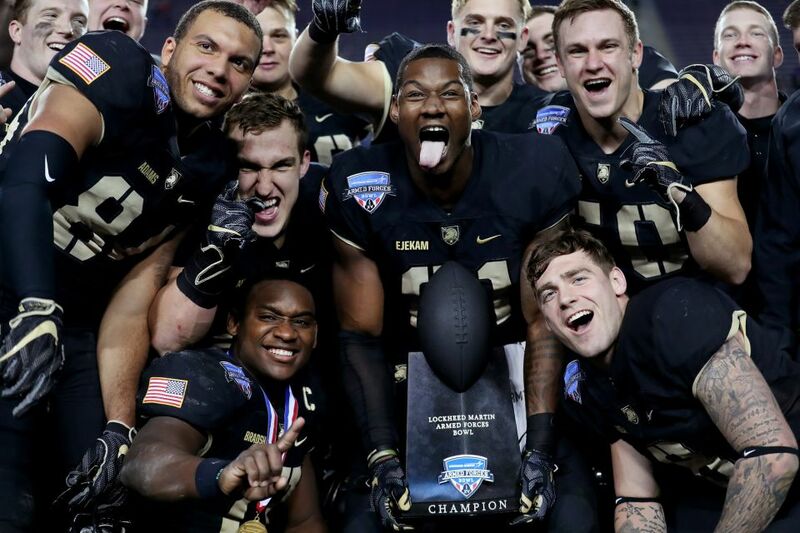 Army fans and cadets are undoubtedly loyal to their team. What other school regularly turns out 100% of available students to their home games? 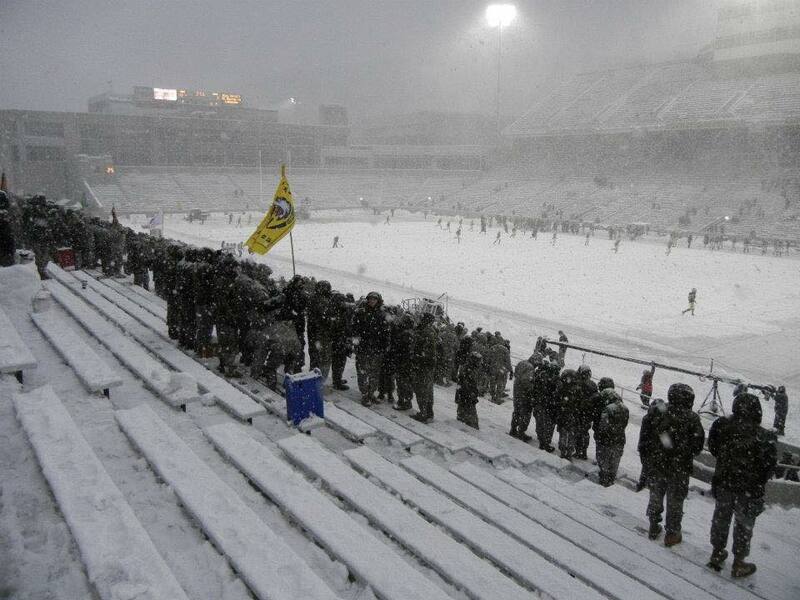 One game that demonstrates the commitment of Army Football fans is the 2011 Fordham Blizzard Bowl. While I was busy warming the bench for the starters, some members of the Corps fearlessly braved the conditions while other cadets crammed into the Michie Stadium bathrooms or snuck back to the Barracks. If you were one of them, I don’t blame you, but your service ribbon just got downgraded to a Certificate of Achievement. Credit to Jeff Evanko (USMA ’13) for the photo. That’s right, no more storing your mess hall milk cartons on the window sill. You can enjoy cold ones all evening long in your room without having to risk getting walking hours. You guys could use the extra protein after dragging Aztec defenders around all game long. Make sure to share with the O-Line! You did everything we asked this year, hitting 43 out of 44 extra points and three field goals. The Army special teams unit represented well this year. But we are going to go ahead and give you a day off next semester for that nasty hit you took from Rashaad Penny. Looked like a blindside hit during the central area pillow fight where he put a lockbox inside his pillowcase instead of the issued skilcraft pillow. You should also get a Ranger Tab from your position coach for the 100% effort that you showed by getting right back up and trying to run him down even though there was a 0% you would catch him. This level of effort spans across the entire team and is why John Voit made the game-saving tackle against Navy this year. When you slipped, I saw the game flash before my eyes, but you somehow managed to stay off your third point of contact. Your modified PLF was AIRBORNE! You reached up as if you were going for the red line on the climbing ropes in Military Movement class. In acknowledgment of your effort, you’re entitled to take your next APFT at Grant Turnaround. We all know it’s only 1.95 miles. Enjoy the improved time. Make sure Alex Aukerman knows when you’re planning to take it as he will also “happen” to be there in Gym-A’s ready to knock out the shortened 2-mile run, just like he was ready to catch the tipped pass. We’ll go ahead and make sure your TAC doesn’t make you take it down during your next SAMI because you need to remember how bada** you looked during each game. You may not have caught as many passes as you would have liked, but you probably lead the nation in pancake blocks for wide receivers. Both you and Jermaine knew and played your roles perfectly this season. 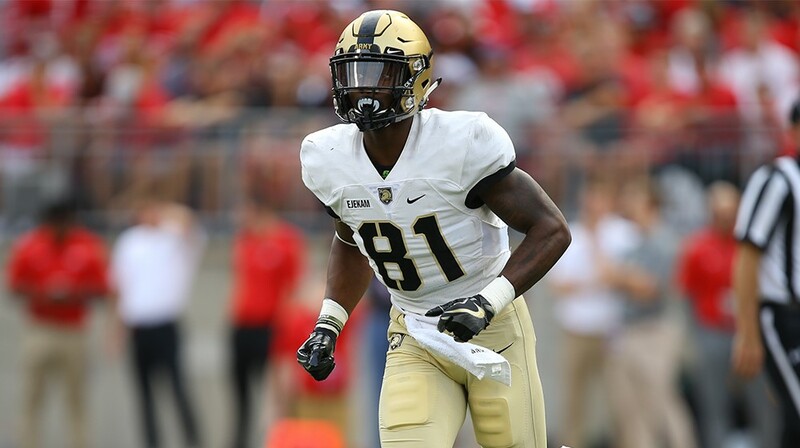 As a former Army wideout, your attitude towards blocking makes me proud. Amhad set the new single-season service academy rushing record with 1,746 yards. He will likely finish as the fifth leading rusher in the nation. Elijah Riley lived up to the pregame hype that I wrote about in my preview article with his 29-yard fumble recovery touchdown that sealed the game. I know it doesn’t feel like much now given that it is winter, but come May you boys will be enjoying the climate control while packing up your room during grad week. So apparently Antonio Rosales does not understand which Holiday Season we are in. 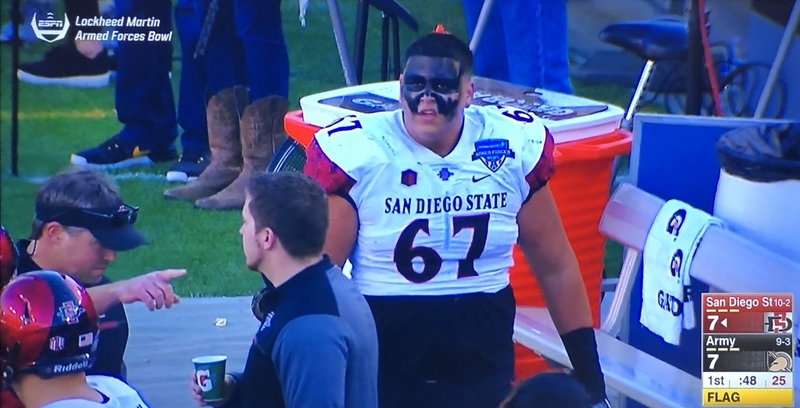 His face paint job looked like a sailor’s poor attempt to dress up as a Soldier with camo during Halloween. The officiating crew took notice and ejected him in the first quarter. That’s right, he got two personal foul penalties. The first was for a late hit and the second? You guessed it…the poor paint job that an OC at JRTC or NTC would kill you on the spot for. You may not have won the game, but we probably made you an extra $1,000,000. Yeah, that’s right, your draft position should jump up a round or two after you rushed 14 times for 221 yards and 4 touchdowns in your final game. The Army team will happily give up those stats in exchange for a victory. Those who watched the broadcast on ESPN will understand why Coach Long deserves this. His stoic demeanor and resiliency to displaying any emotions should be an example for all aspiring field grade officers to follow. Keeping your cool in the Battalion training meeting while covering flags greater than 180 days is hard to do. His statue down at the river courts will be seen by cadets heading to NYC via the garrison ferry each weekend. In Week 15 San Diego State received 40 votes for top 25 in the AP Poll and 50 votes in the Coaches Poll. 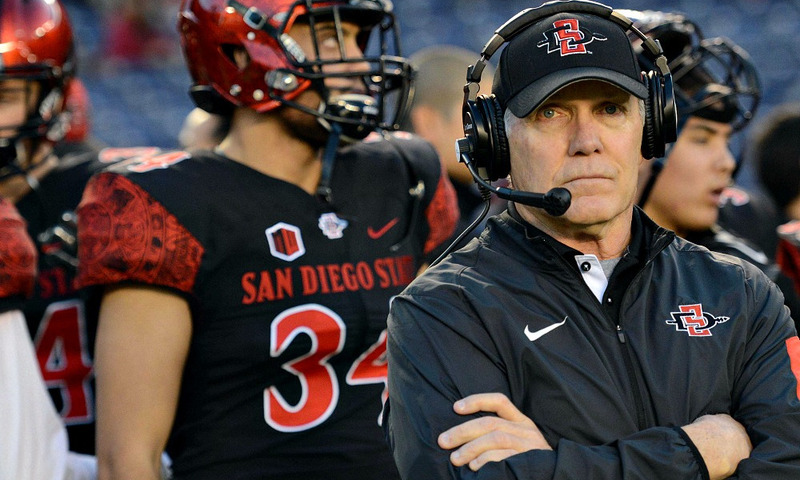 In week 14, the Aztecs were ranked 25th in the Coaches Poll before being pushed out after Conference Championship weekend. 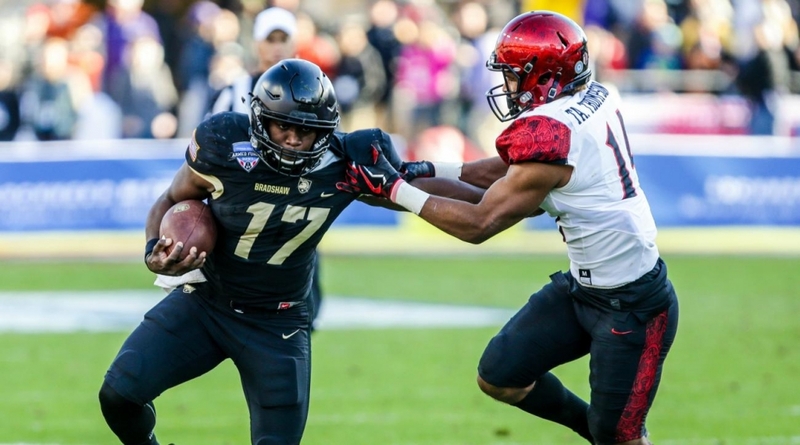 The Black Knights have received votes in at least one of the polls since Week 10. The height was in Week 12 before the North Texas loss where we recieved 14 votes in the Coaches Poll and 3 in the AP. I expect the Black Knights to be ranked #25 after Bowl Season. Congratulations Boys!